Create Beauty with Flowers that Bloom in Winter - Executive Landscaping, Inc.
Commercial properties should always stand out from their surroundings, and creating visual interest is an important aspect of that. The more colorful and unique the landscape, the more they attract people’s attention – and in business, that’s a great thing. Unfortunately, having a great landscape design means nothing if it’s not well maintained; and during the cold months of winter, even the most colorful landscape often fades into bleakness under the harshness of the season. 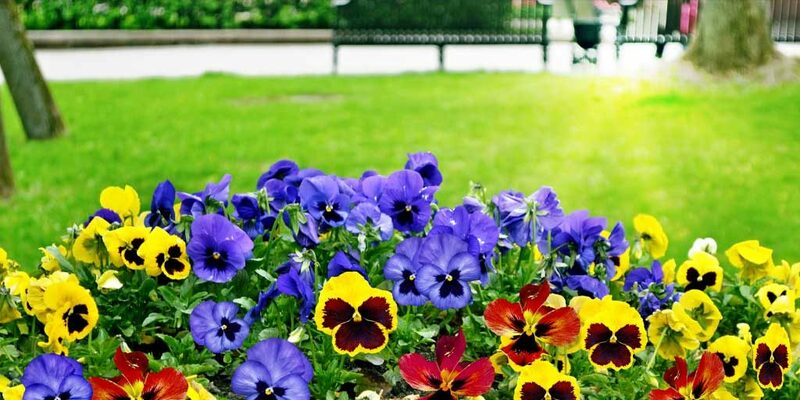 For that reason, planting flowers that bloom in winter is important to any landscape, as taking that added step ensures that your commercial property is still colorful, vibrant and appealing even when the weather turns cold. There are many flowers that bloom in winter, so discuss your needs with a landscaping expert to better determine which types are best for your area and your particular vision. At Executive Landscaping, Inc., we offer our expertise in selecting the perfect options and helping bring out the bloom in your business. Ornamental varieties of cabbage and kale are often used as seasonal color accents within beds of hardy pansies and violas and are a great way of adding a layer of texture. Interestingly, as temperatures run lower, the plants become more compact in size. Available in red, deep purples, greens or green with a white or pink center, cabbage and kale bring a rich, interesting element to any commercial garden. One of the top choices for flowers that bloom in winter, pansies, come in a variety of colors that includes yellow, orange, white, blue, purple and rose. They survive frigid temperatures and recover quickly after frost, so they are the most popular variety of flower for winter-time landscapes and containers. Because they grow lower to the ground, pansies are an ideal pop of color for edges, entryways, containers and other focal points. Once they’ve fully established themselves, pansies require a minimum amount of care. Violas are another popular choice of flowers that bloom in winter, offering a varied color palette that seems limitless in its options. Violas have a small bloom but are still highly visible and provide the advantage of being sturdy, low maintenance and cold-weather hardy. With their wide variety of colors, violas are ideal for use in containers and garden bed borders. At Executive Landscaping, Inc., we’ve spent decades serving clients throughout the Gulf Coast and stand on the reputation we’ve created by providing quality service and making properties in our community true masterpieces. From large-scale commercial properties to single-family residential projects, we’re beautifying our area one landscape at a time. Call the landscaping experts at Executive Landscaping, Inc. to learn more about your best options in flowers that bloom in winter today!